The 2015 TCS New York City Marathon is this Sunday. Drawing upwards of 50,000 participants, the race is the most popular marathon in the world. Every year, a group of celebrities join the masses and run the race to raise funds and awareness for important causes. This year, that group includes Alicia Keys, Ethan Hawke, and James Blake, among others. A marathon is not an easy feat even for the fittest celebrities, and they've all put in hours of training for the big day. 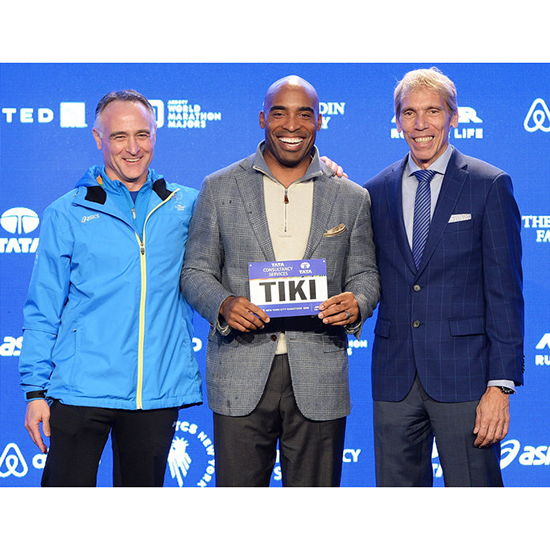 Here’s how Tiki Barber (above, center) and Katrina Bowden, two stars who've already run this same course, suggest preparing, whether you’re trying to complete a 5K or the full 26.2 miles. “I’ve run the course before. It won’t be any easier, but running feeds my competitive nature so I’m going to try to push harder and beat my finish time from last year,” says Bowden, who is running on behalf of the Leukemia and Lymphoma Society, which works to find cures and ensure access to treatments for blood cancer (leukemia, lymphoma, Hodgkin's disease, myeloma) patients.